So, you know about my purchase of Weeks Grand Dame … She inspired a whole new bed. We didn’t want to crowd her. The project started with some double digging (hard work when you have clay soil). Then we moved to the “tiller” phase. Problem # 1, our tiller would not start. 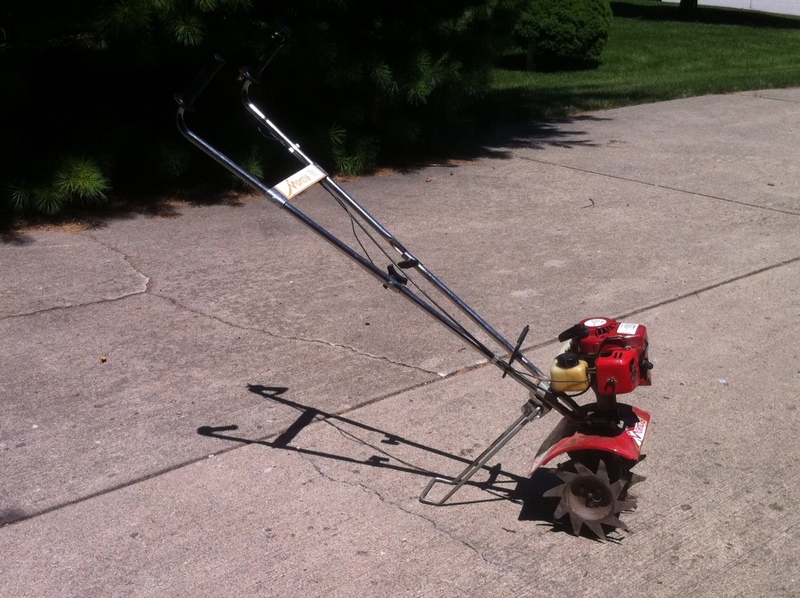 Neighbor kindly loaned us his “tiller.” Problem # 2, the neighbor’s tiller is tiny … not up to THIS task. 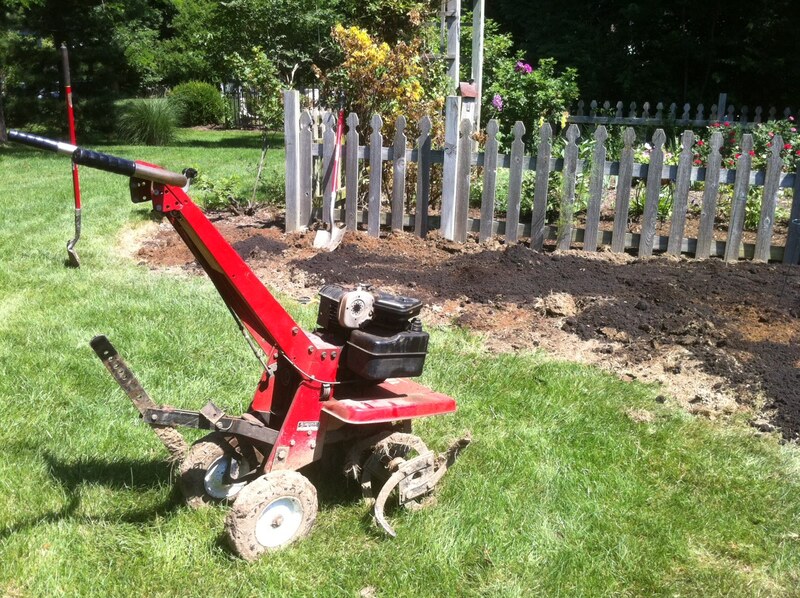 Problem # 2 solved when a friend loaned us his large tiller … definitely up to the task! Thanks David! Cute … very cute, but not up to this task! This machine is ready for anything! 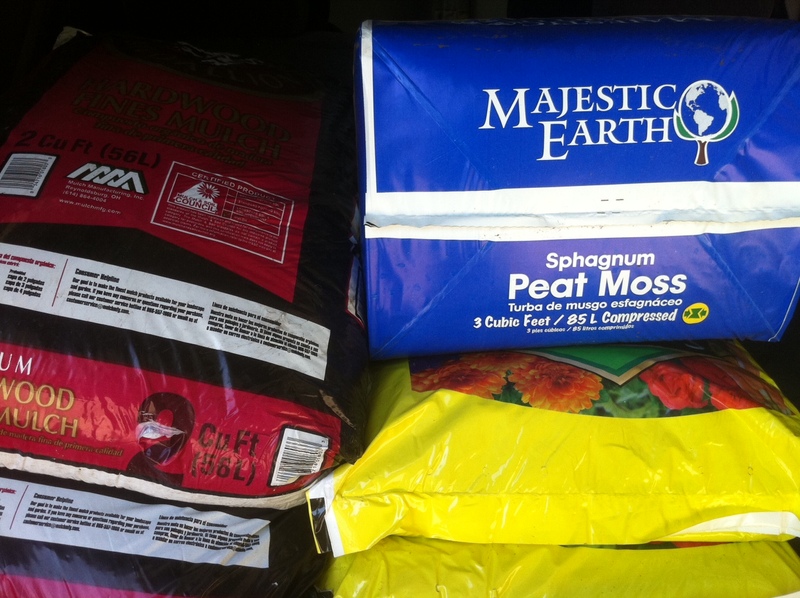 What did we “till” in to the Dame’s new home — 3.8 cubic ft of peat moss, 20 bags of top soil, 6 bags of compost and 2 bags of manure. A combination worthy of … “The Dame”! 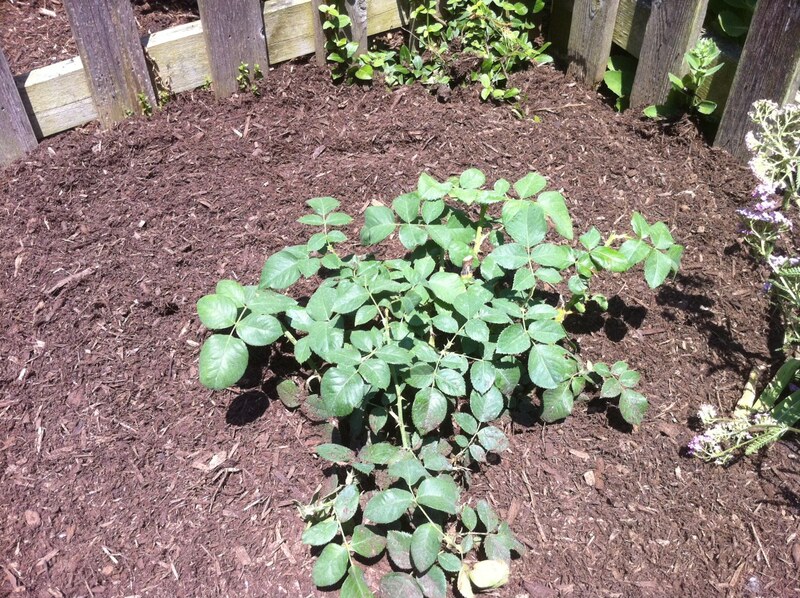 The Grand Dame was planted with the bud union appropriately 2″ below ground level (Zone 5 precaution), watered in with the amazing Moo Poo and topped with fine mulch. She should be good to go. But we will keep an eye on her. Planting her in the heat of July was not the kindest thing to do. All she needs now is her very own name plate from Harlane! BLOOM WATCH has officially started! As grand as I know she will someday be, she sure looks lonely! 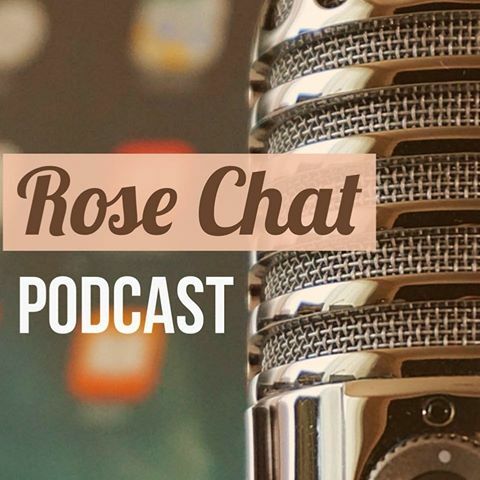 I have a feeling that my #gardenchat and #rosechat friends will have several recommendations for some suitable additions. What rose(s) do you recommend as companions to The Dame in our new bed? I’m excited to see it flower! I am beginning to see new red leaves! Excited. I love love love the shape of the new bed! What a great idea!!! L-o-v-e it. I don’t have any recommendations for any companions for your new bed and new rose right now but what I do want to say now is “girl”, if I may call you that, you are one heck of a gardener and you do it right…..what a treat it is to read your posts about what do and how you do it….The only thing I else I got to say is when among my old dear friends, when we do something the other guys or girls really like or admire we say to each other, “I hear ya”….”Teresa, I hear ya”….Always a pleasure visiting you…..
You know me, I have an opinion about everything…… Queen Elizabeth was the original grandiflora and is the standard for all that follow her. Her light Pink blooms will provide a nice contrast to Grand Dames deeper hues. She likes to be pruned tall for maximum blooming power. “Mary Rose”, a David Austin, would be another suggestion. Nice rounded shrub and a beautiful old world bloom and fragrance. “Our Lady of Guadalupe”, a floribunda by J & P is a low growing rose with beautiful silvery pink blooms. Quite disease resistant too! 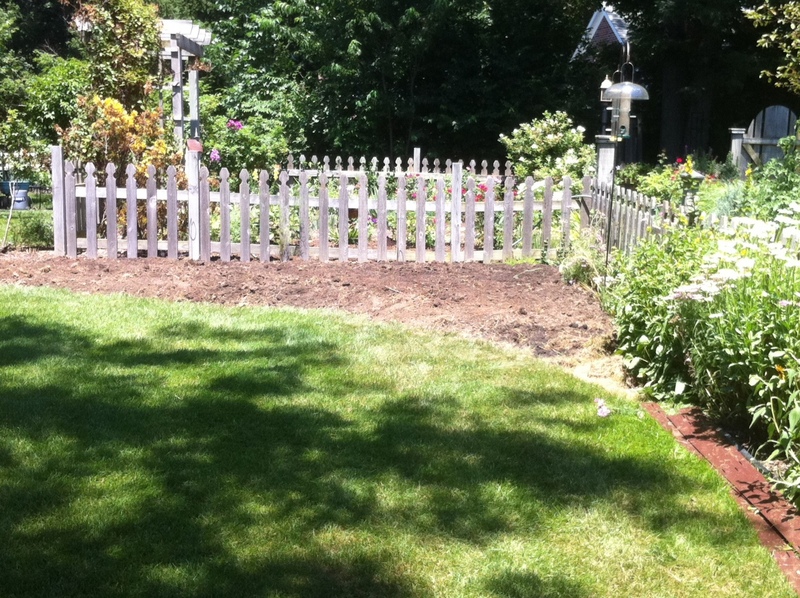 A planting of lavender or larkspur would make excellent companions for this bed. I have a list of about 20 others, but I digress….. Can’t wait to see how this turns out! Thanks Chris! That is just what I want … opinions and advice! Love your ideas!